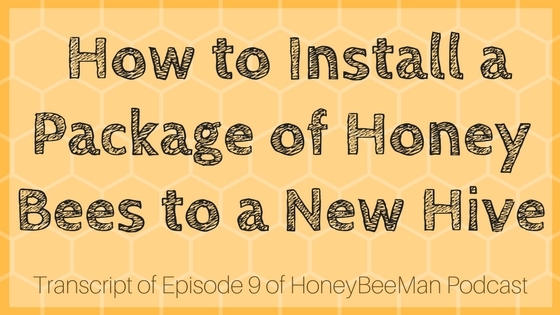 The following is a transcript of Honey Bee Man Episode 9 – How to Install a Package of Honey Bees to a New Hive – Unfortunately, it looks like TalkShoe has retired the show and the audios are no longer available there. Today we’re going to talk about how to start your own hive, how to install a package of bees. First of all, you need to have your hive set up in the location that is ideal for your bees. You want to make sure that you have a water source nearby. You want to make sure that you have the hive elevated up off the ground so that weeds don’t cover the entrance. You want to have it in an area that is not going to flood. You want to make sure that you have the skunks and raccoons under control around the hive. You need a bottom, you need a deep super, and you probably want a feeder on the hive to start out with. When you install a package of bees, you typically will want to feed some sugar water. You want an inner cover and a cover over the top. That’s the necessities to start the hive. Ideally, you want to have drawn comb. If you don’t have drawn comb, you can start out without, you can start out just on plain foundation and see if the bees will get started without having drawn comb. You’re going to be starting out purchasing a package of bees from a bee supplier. Most of these suppliers are in the southern United States, and most of these supply companies can send out as many of these packages as you need. Often, you can have other local beekeepers in your area pick these bees up and directly transport them back to your local area. That’s typically the best way to get the bees. That way you know that they’re spending much time sitting in a Post Office. But, you can actually have the bees shipped. 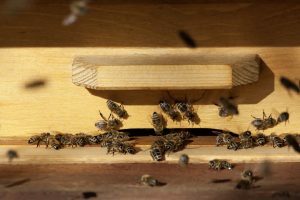 They typically put three pounds of bees and a queen bee mounted inside a small wooden box. The box is made out of wood, it has four wooden sides and on two sides it’s screen. That holds the bees inside this container. Then inside of the container there will be a metal can and inside that can is sugar water. The bees will cluster around that sugar water and take that sugar water during the delivery time, so that gives them something to eat while they’re in transport. When you get your package of bees, you need to install them right away. You don’t want them sitting around for weeks, because they’ll die if they’re not released and put into the hive. You’ll need to have all of your protective gear and you need to have your hive set up. In the hive what you need to do is open up your hive – you don’t have any sugar water in your feeder yet. You open up your hive and you’ll have a base set in there and you have a deep set in there. On the deep, you have your 10 frames inside there. Typically, the ideal method to do this is to have an empty medium honey super with no frames, put that on top of your hive, and then take maybe two frames out of your deep hive so that you have a gap in the middle. Then what you do is take a warm water – not hot – in a spray bottle and you put just a little bit of sugar in that and you make a mist. Then you can spray through the screen on your bees in the package, spray them down just a little bit so that they’re a little sticky on the outside. This kind of helps them to not fly so much while you try to dump them from this package into your brand new beehive. When you get the bees, they’re going to have a little wooden cover covering the top. You going to want to pry that off with your bee tool. Before you do this, you want to make sure that you’re all suited up. Anybody around needs to be suited up so that you’ve properly protected yourself. You pull off the wooden cover and under that cover you’ll see the metal can. You take your hive tool or a screwdriver and you pry this metal can up and out of the box. When you pull this up, you’re also going to see out the side a little strap. That strap has the queen cage attached to it. What you want to do, very carefully, (and it’s helpful if you have a couple of people there) you pull the can out, real quickly you grab the strap and you pull the queen cage out. The queen cage is going to have lots of worker bees clung to the queen cage, because they want to be near the queen. You’re going to shake that off gently, not real hard because you don’t want to hurt the queen. Shake the vast majority of the bees off, so that there aren’t quite so many of them on there. Then take that queen cage and mount that between two of your deep frames in your permanent hive. This is going to make the bees want to stay in the hive, so you want to mount that down between the frames. It’s helpful to do that without having the box open. You basically lift this can out, pull the queen out, close it back up – not fully, but just close it up so that the bees can’t get out. You don’t even have to put the can back in, you can just pull the can off and then set the can off to the side. If there are bees on it, it won’t hurt anything, they’ll eventually go back to the queen. Just set it to the side, then take your cover and put it back over that hole so that the bees aren’t flying out of that hole. Once you have the queen down between the frames, take the bees from your package. Take the cover off and gently shake the bees down inside the hive. This medium super is sitting on top of the deep box, so it acts as a funnel and the bees tend to go down inside the hive. Once the bees are in, give them a few minutes to kind of crawl down between the frames. They typically will want to crawl down in. Occasionally, they want to crawl out. If they start crawling up the sides, the best thing to do is just throw the cover on top for awhile and let them have 10 or 15 minutes to crawl back down and find the queen. Once they find the queen, they calm down a little bit and they’ll stay there, they’re not going to go anywhere. They won’t necessarily crawl away, they’re going to stay there with the hive. If you have time to let them just get accustomed to the hive, you can just leave the medium super on the top there and just throw the cover on it for awhile and let them go. You don’t want to leave them like this for a long period of time, because they will fill that whole entire top of that box with honeycomb before you know it. The important thing is to make sure that you get all of the bees in the box. They’re going to stay there with that queen, so you could even leave that medium sitting there for a day if you wanted to, come back the next day and the bees will all be down in between the frames in the deep box. You pull the medium off, you set your feeder down on top of that, and then you just leave those bees and they’ll draw comb like you wouldn’t believe. The queen stays inside there. The only other thing that we need to talk about is the queen cage has a cork covering two ends of the cage. You want to open up the cork that has the candy end. What happens is the worker bees want to free that queen out of that cage, so if you pull that cork out of the candy end the bees will eat that candy out and they’ll free that queen. It takes about a day to a day and a half to get her out of there. If you want to speed up that process just a little bit, you want to give them a day or so to let the workers free the queen, you can speed that up just by taking a little nail, a really small screwdriver, or even a small pocket knife, and just poke a little starter hole through that sugar and that makes it a little easier for the workers to get that sugar out of that candy piece. That’s about it, that’s how you dump your bees into your new hive. I would highly recommend you find a local beekeeper that you can use as a mentor, because you don’t really want to be doing this without any help. This is something that ideally it would be nice if you could find a local guy to help you out. Most of these guys, if they have time, they’re going to be more than happy to help you out and work with new beekeepers. Enjoy. Don’t get stung. Have a great day. This video documents two ways of installing a new package of honey bees. One way demonstrates the more traditional method of shaking the bees from the package into the Langstroth Hive. The other method demonstrates how to simply place the new bee package directly into the hive.